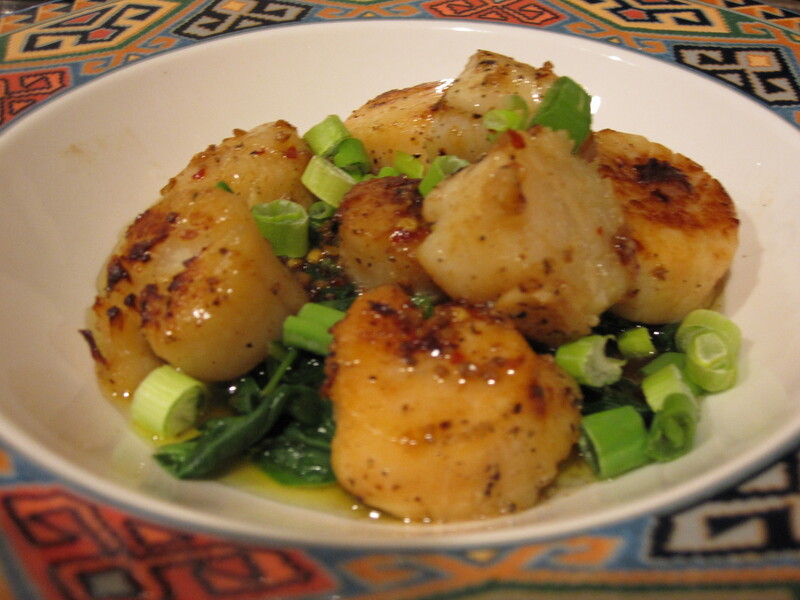 Scallops are one of our favorite foods to eat, but making them at home can be a little tricky. 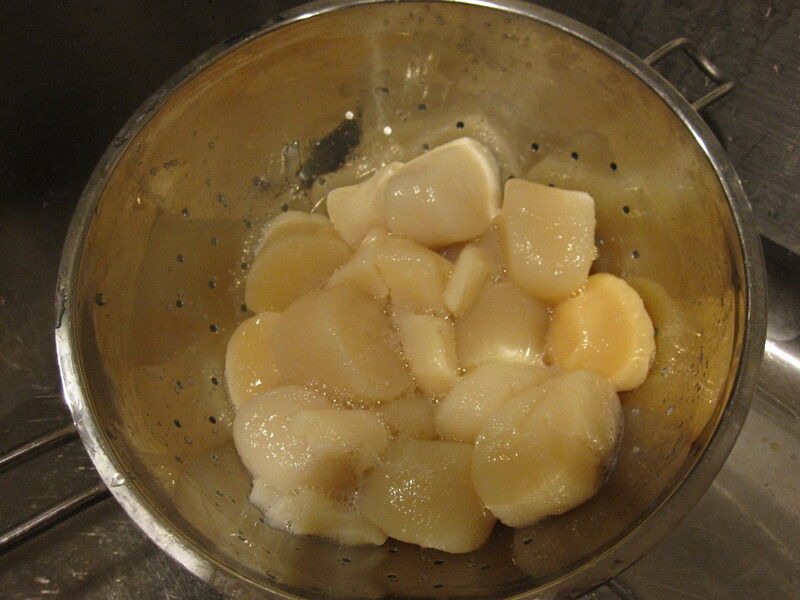 We have made many attempts at cooking them though and I think we got one step closer this time.We picked up some really nice looking scallops at Giant. 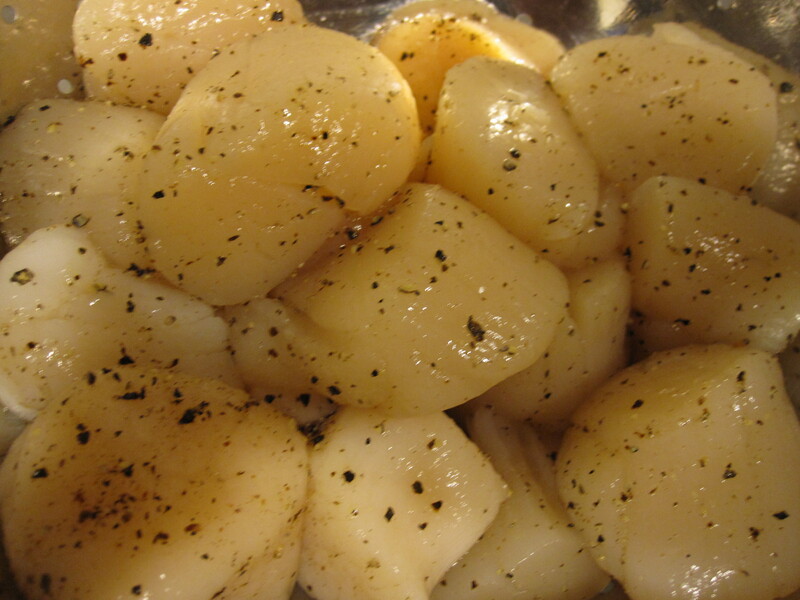 We prefer the bigger sea scallops rather than the smaller bay scallops. They have an almost “meaty” texture. 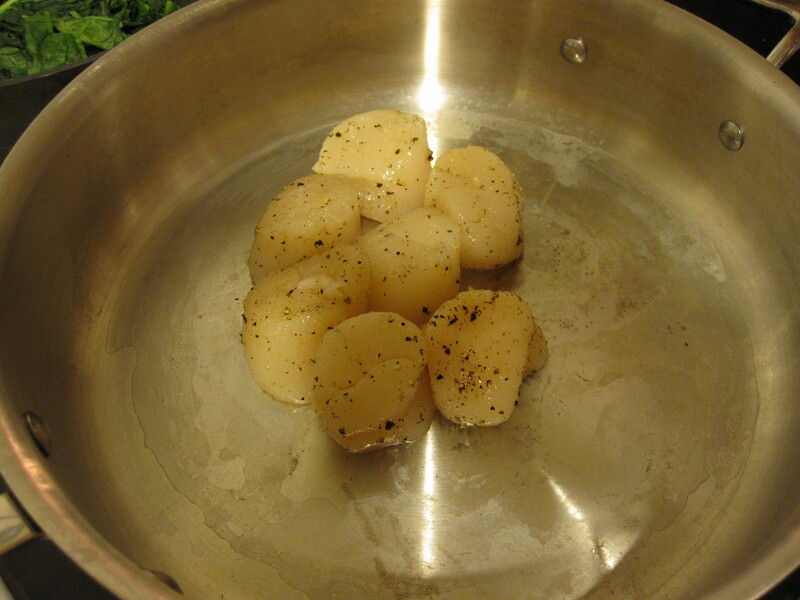 We seasoned these with salt and pepper. Anyway- as I said, they still tasted really good. 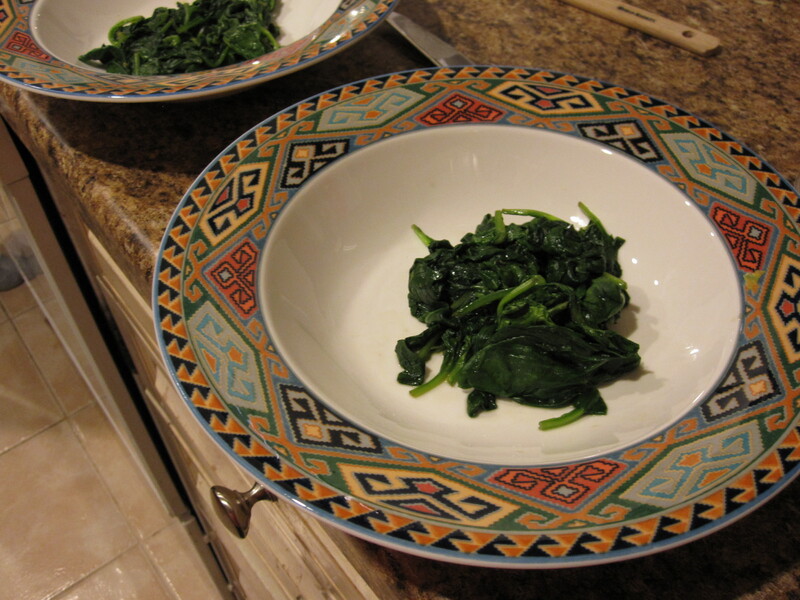 I sauteed some spinach and placed this on the plate (er, small bowl) for the base. 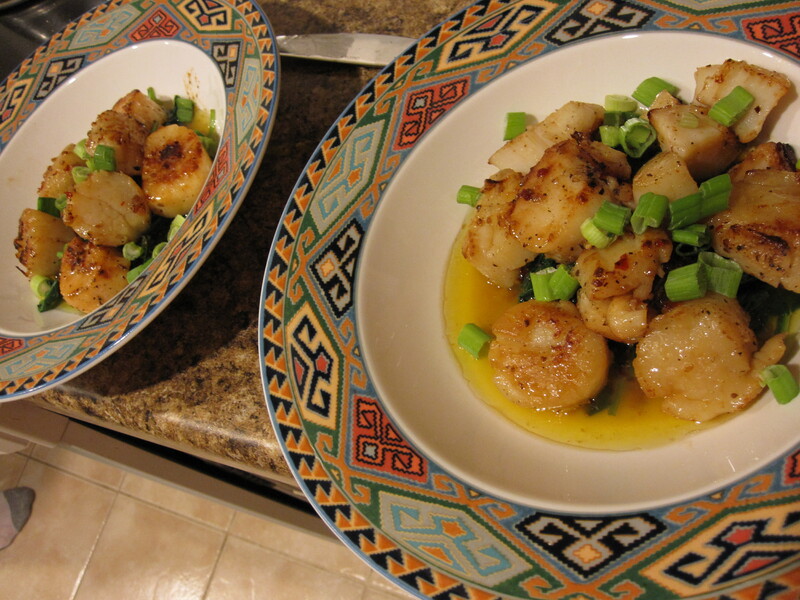 Then placed the scallops on top— kinda seared actually! 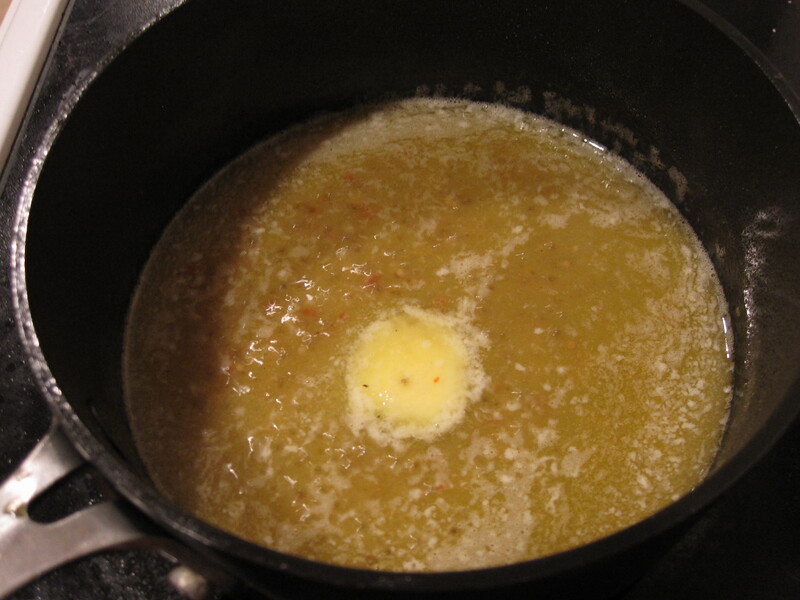 The sauce we made was a white wine butter sauce with lemon and garlic and red pepper flakes, of course. 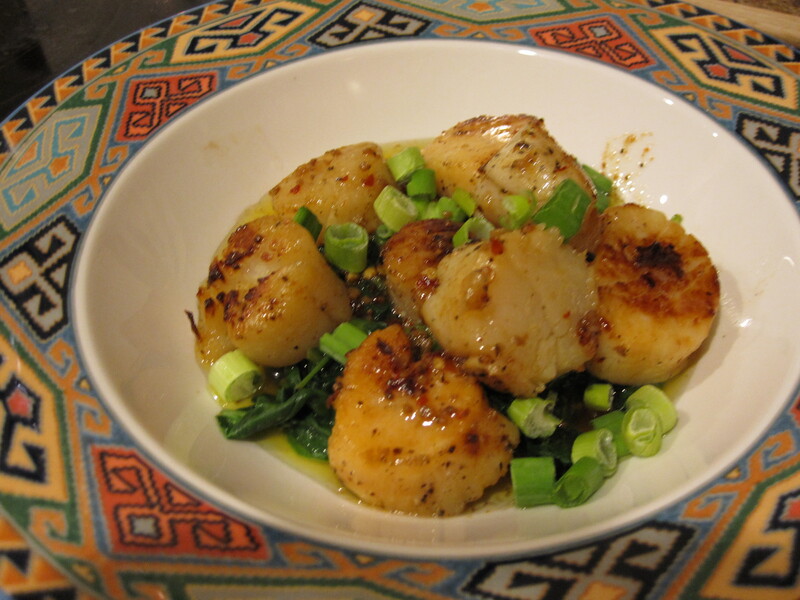 We topped it with green onion. All in all, they came out tasting pretty good. 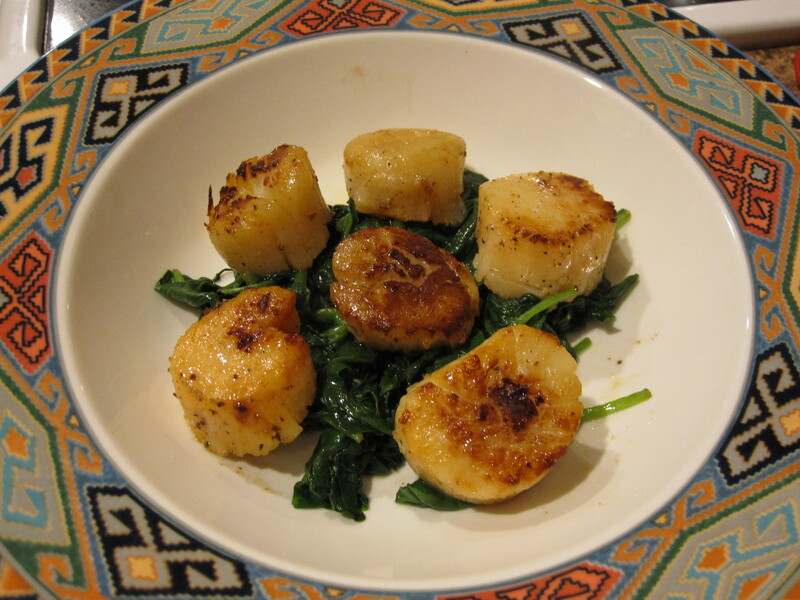 It’s tough to really infuse scallops with much flavor, which is why I like to serve them atop the spinach, which tends to absorb some of the sauce so you can get some really tasty bites! 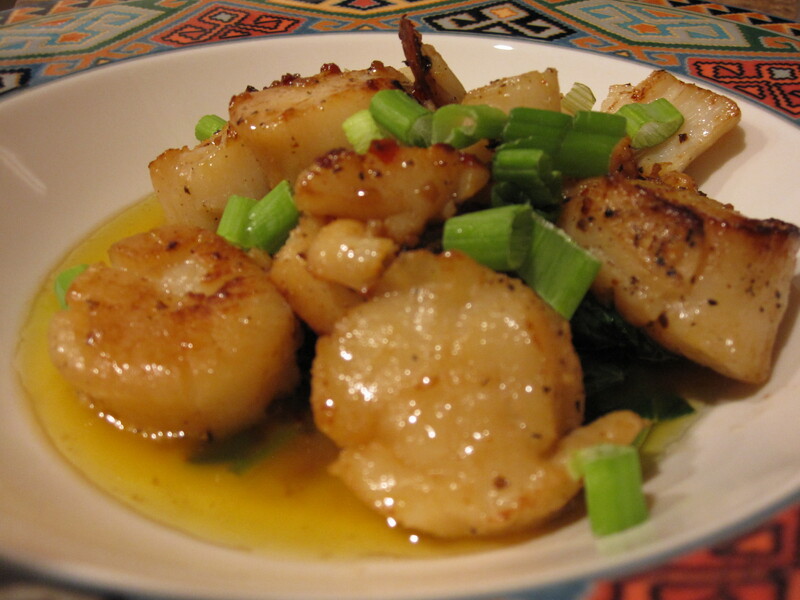 This entry was posted in Seafood and tagged dinner ideas, garlic, homemade, low carb, seafood, wine. Bookmark the permalink. Hi! 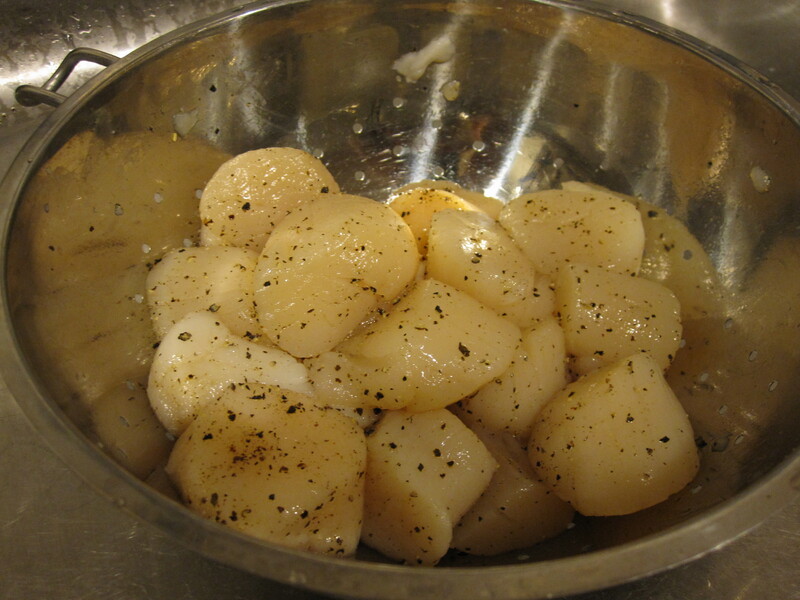 Make sure you pat the scallops dry before you put them in the pan and just hit them with a pinch of salt. 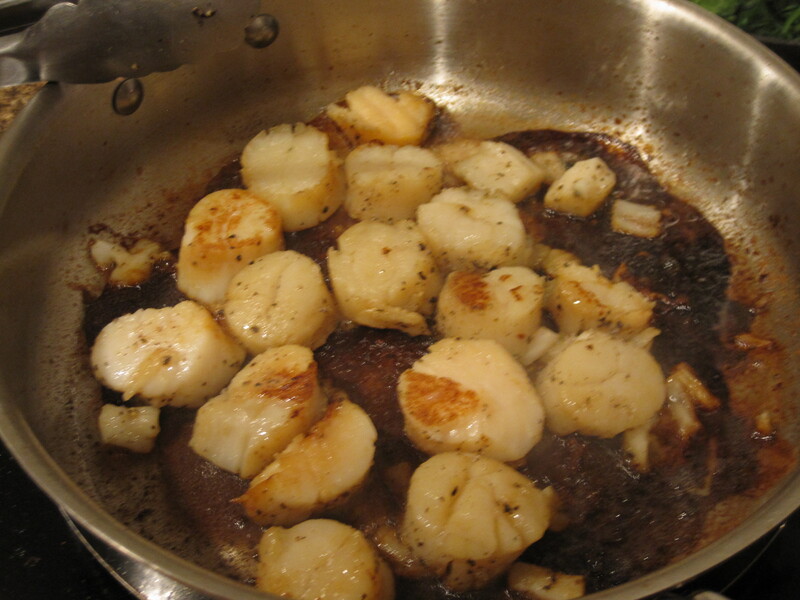 A little olive oil in the pan, get it good and hot, then put the scallops in. 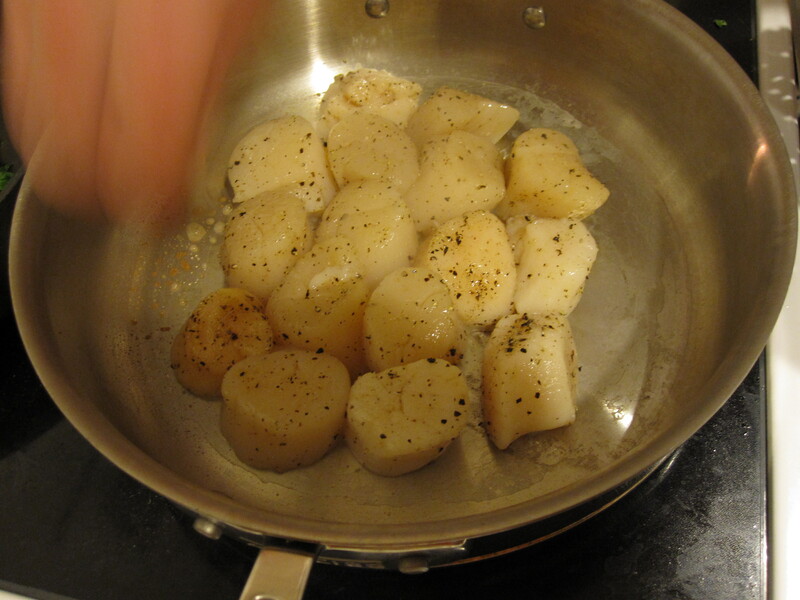 Make sure you don’t crowd the pan – that picture looks very crowded. Two minutes on the first side (DON’T TOUCH THEM), then another minute on the other side. 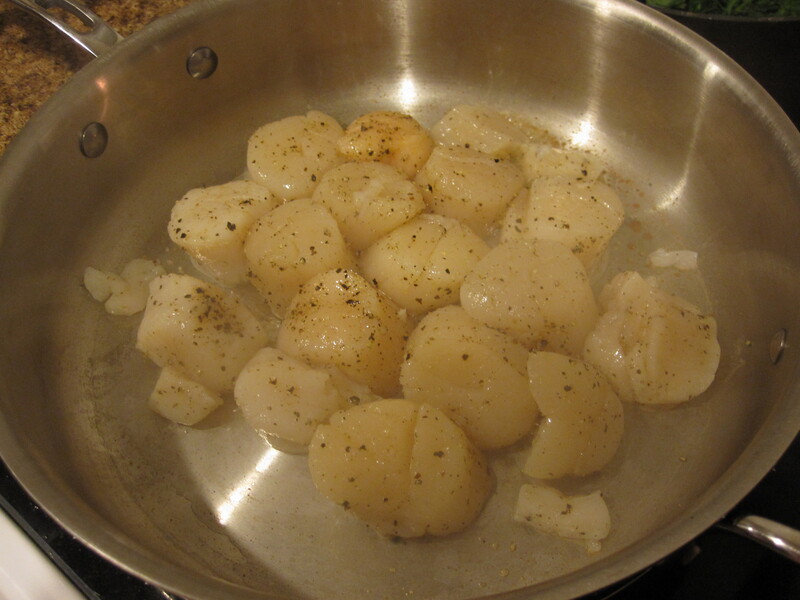 Perfect seared scallops every time. As long as they’re dry and you don’t touch them for the first two minutes, you’ll be good. PS – I like the blog. Thanks for the tip Ralpho! We will try your method next time and see how it goes.